INTRODUCTION. The Subject and Objectives of the Research. Refinement of concepts. The State of the Art. The Research Outline. The Methodology. OLIGOPOLISTIC VERTICAL INTEGRATION WITH SYMMETRIC OBJECTIVES. Vertical Integration in a Successive Duopoly with Fixed Proportions of Inputs. A Basic Successive Duopoly Model. The Analytical Framework. Some Preliminary Results. Vertical Integration in a Cournot Successive Oligopoly. Horizontal Market Structure and Generic Vertical Industrial Structures. The Degree of Vertical Integration and Equilibria in Mixed Integration Games. Profit Incentives and Endogeneity of Vertical Industrial Structure. Vertical Integration in a Differentiated Duopoly. A Model of Successive Cournot Duopoly with Product Differentiation. Equilibrium Analysis. Product Differentiation and Equilibrium Vertical Structure. Vertical Integration in a Successive Oligopoly with Variable Proportions of Intermediate Inputs. A Basic Framework. Equilibrium Analysis. Pre-Integration Vertical Structure and the Consequence of Vertical Integration. OLIGOPOLISTIC VERTICAL INTEGRATION WITH ASYMMETRIC OBJECTIVES. Vertical Integration in a Successive Oligopoly with Asymmetric Objectives. A Model of Mixed Successive Oligopoly. Equilibrium Analysis. Major Findings. GENERAL CONCLUSIONS. References. Index. In this text some fundamental issues concerning the strategic impact of vertical structures of firms are discussed in a successive oligopoly model. Vertical integration strategy has been identified as one of the key strategies which determine the success or failure of enterprises. Many studies on vertical integration are based on business experiences and interviews with managers. 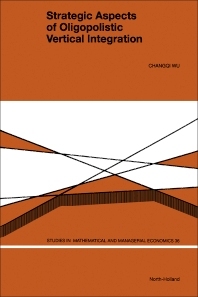 However, the extensive application of game theory in business economics allows this study on vertical integration to be based on sound theoretic ground. Moreover, the significance of public enterprises in some Western European economies and the trends of economic transition in Eastern Europe justify the efforts to analyse vertical integration issues in the mixed market, which is created by the participation of a public firm into an industry otherwise characterised as a successive oligopoly.